The composition of the essential oil of Sage makes it a powerful antibacterial, bactericidal, fungicidal, insecticidal and insect repelling agent. 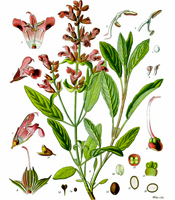 The properties of essential oil of sage have been the subjects of numerous scientific studies, and this is one of the few essential oils of which the exact clinical toxicity thresholds are known. "Insects" and "Parasites" Formulas offered on this site contain the essential oil of Salvia sclarea, with equivalent insecticidal properties, less the neurotoxicity related to large amounts of camphor present in Salvia officinalis described in this study.